For some odd reason, I always think of this scene — The New Phone Book’s Here – from an old Steve Martin comedy whenever Gartner rolls out their new Magic Quadrants (MQ) for corporate performance management (CPM). It’s probably because all of the excitement they generate. Last year, Gartner researchers John Van Decker and Chris Iervolino kept that excitement up by making the provocative move of splitting the CPM quadrant in two — strategic CPM (SCPM) and financial CPM (FCPM). Never complacent, this year they stirred things up again by inserting the word “cloud” before the category name for each; we’ll discuss the ramifications of that in a minute. You can download both the financial CPM and strategic CPM magic quadrants for free, courtesy of Host Analytics, here. Gartner customers with appropriate login credentials can download the SCPM magic quadrant or download the FCPM magic quadrant, here. The biggest change this year is the insertion of the word “cloud” in the title of the magic quadrants. This perhaps seemingly small change, like a butterfly effect, results in an entirely new world order where two of the three megavendors in the category (i.e., IBM, SAP) get displaced from market leadership due to the lack of the credibility and/or sophistication of their cloud offerings. In the strategic CPM quadrant, IBM is relegated to the Visionary quadrant (bottom right) and SAP does not even make the cut. In the financial CPM quadrant, IBM is relegated to the Challenger quadrant (top left) and SAP again does not even make the cut. Well, I suppose one might then ask, well if IBM and SAP do poorly in the cloud financial and strategic CPM magic quadrants, then how do they do in the “regular” ones? To which the answer is, there aren’t any “regular” ones; they only made cloud ones. That’s the point. Who cares how much maintenance fees a vendor derives from legacy products? The size of a vendor’s legacy base is independent of its position for the future. The cloud is now the norm in CPM product selection, so it’s uninteresting to even produce a non-cloud MQ for CPM. The only CPM MQs are the cloud ones. While I have plenty of beefs with Oracle as a prospective business partner — and nearly as many with their cloud EPM offerings — to their credit, they have been making an effort at cloud EPM while IBM and SAP seem to have somehow been caught off-guard, at least from an EPM perspective. This creates the rather odd situation where there are only two vendors in the Leaders section of both the financial and strategic CPM magic quadrants: Host Analytics and Oracle. That means only two vendors can provide the depth and breadth of products in the cloud to qualify for the Leaders quadrant in both the FCPM and SCPM MQ. I know who I’d rather buy from. Your problem is you are out of compliance with the license agreement and we’re going to shut down the system. The solution is to give us money. For more editorial, you can read John O’Rourke’s post on the Host Analytics corporate blog. Or you can download the new 2017 Gartner CPM MQs here. Gartner refers to the category as corporate performance management (CPM). I generally refer to it as enterprise performance management (EPM), reflecting the fact that EPM software is useful not only for corporations, but other forms of organization such as not-for-profit, partnerships, government, etc. That difference aside, I generally view EPM and CPM as synonyms. 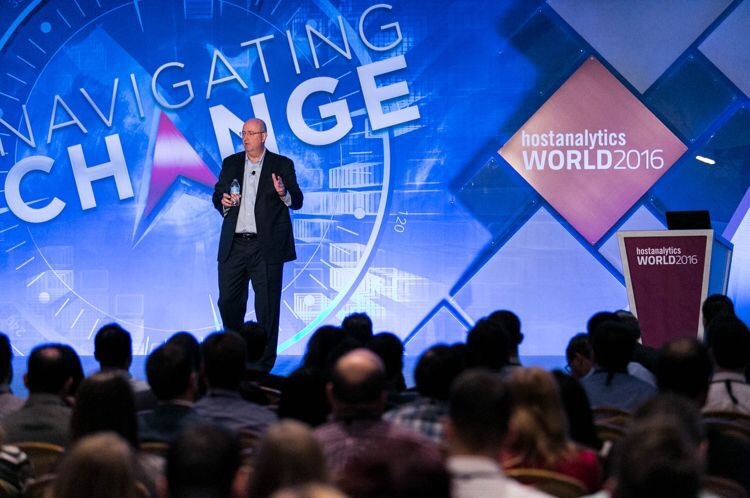 The theme of my presentation at past spring’s Host Analytics World was that EPM is needed in fair, foul, or uncertain weather. While EPM is used differently in fair and foul weather scenarios, it is a critical navigational instrument to help pilot the business. You’re probably making P&L, budget, and spend authority more centralized in order to keep tighter reins on the company. These (and others) are all capabilities of a complete EPM suite. The point is that you use that suite differently depending on the state of the business and the economy. Well, now with the surprise election of our 45th President, Donald Trump, we can be certain of one thing: uncertain times. Will massive investments in infrastructure (including but not limited to, The Wall) happen and what effect will that have on economic growth and interest rates? Will Trump deliver the promise 4% GDP growth that he’s promised or will the economy grow slower? Will promised deregulation happen and if so will it accelerate economic growth? What effects will deregulation have on key industries like financial services, energy, and raw materials? What, as a result of this and foreign policies, will be the price of a barrel of oil in one year? What effect will that have on key industries such as transportation? Will Trump spark a trade war, increasing the price imports and reducing the purchasing power of low and middle-income consumers? What effect might a trade war have on GDP growth? What impact will all this have on financial markets and the cost and availability of capital? I don’t pretend to know the answers to these questions. I do know, however, that there is uncertainty about all of these questions– and dozens of others — that will directly impact businesses in their performance and planning. If you cannot predict the future, you should at least be able to respond to it in agile way. If your company takes 6 months to make a budget that gets changed once a year, you will be very exposed to surprise changes. If you run on rolling forecasts, you will be far more agile. If you have good EPM tools you will able to automate tasks like reporting, consolidation, and forecasting in order to free up time for the now much more important tasks of scenario planning and modeling. Again, if you can’t know whether oil will be $40, $50, or $70 — you can at least have modeling out all three scenarios in advance so you can react quickly when it moves. I’ve always been a big believer in planning and EPM. And, in this uncertain environment, companies need EPM now more than ever. This week Gartner research vice president John Van Decker and research director Chris Iervolino took the bold move of splitting the corporate performance management (CPM), also known as enterprise performance management (EPM), magic quadrant in two. Strategic Corporate Performance Management (SCPM) Solutions – this includes Corporate Planning and Modeling, Integrated Financial Planning, Strategy Management, Profitability Management, and Performance Reporting. You can download these new CPM magic quadrants here. It’s bold. It’s the first time to my recollection that an MQ has included product from different categories. Put differently, normally MQs are full of substitute products — e.g., 15 different types of butter. Here, we have butter next to olive oil on the same MQ. It’s smart. Their uber point is that while CPM solutions are now pretty varied, that you can pretty easily classify them into more tactical/financial uses and more strategic uses. Highlighting this by splitting the MQs does customers a service because it reminds them to think both tactically and strategically. That’s important — and often needed in many finance departments who are struggling simply to keep up with the ongoing tactical workload. It’s potentially confusing. You can find not just substitutes but complements on the same MQ. For example, Host Analytics and our partner Blackline are both on the FCPM MQ. That’s cool because we both serve core finance needs. It’s potentially confusing because we do one thing and they do another. We are stoked. Among cloud pure-play EPM vendors, Host Analytics is the only supplier listed on both MQs. We believe this supports our contention that we have the broadest pure-play cloud EPM product line in the business. Only Host has both! In a hype-filled world, I think Gartner does a great job of seeing through the hype-haze and focusing on customers and solutions. They do a better job than most at not being over-influenced by Halo Effects, and I suspect that’s because they spend a lot of time talking to real customers about solving real problems. For more, see the Future of Finance blog post on the new MQs or just go ahead and download them here. 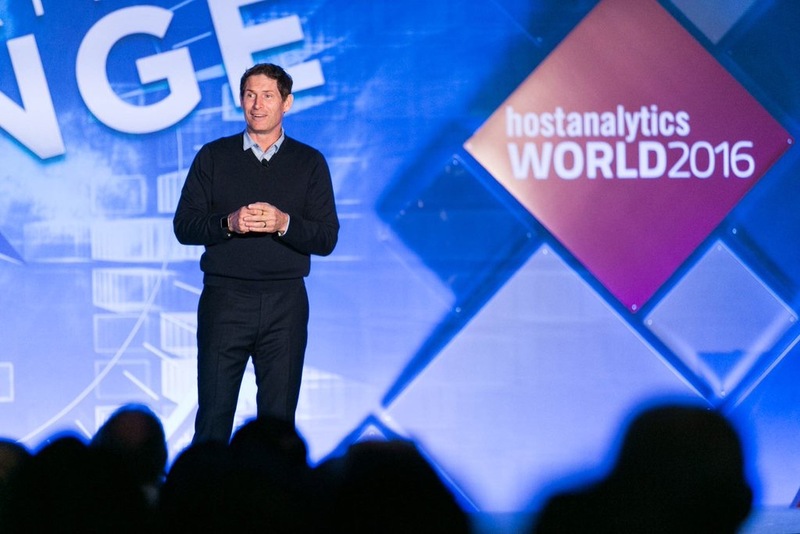 We’re just finishing up a fantastic Host Analytics World 2016, with over 800 people gathered together in San Francisco to talk about enterprise performance management (EPM). Here are a few pictures to give you a feel for the event. Here’s me delivering my keynote on EPM in fair weather and foul. Here’s an artsy shot of someone taking a picture during my keynote. 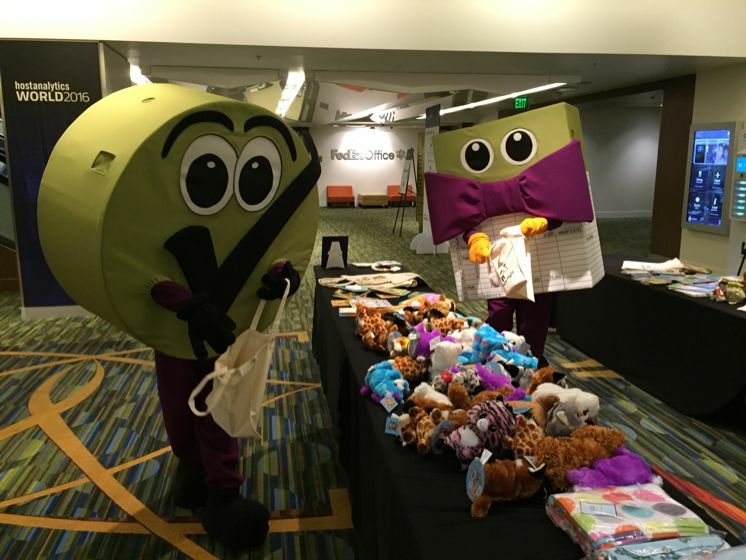 And, of course, here are our mascots, Tick and Tie, stuffing bags for Project Night Night, the philanthropic activity we had at the conference cosponsored by Host Analytics and our amazing customer, Thrivent Financial. 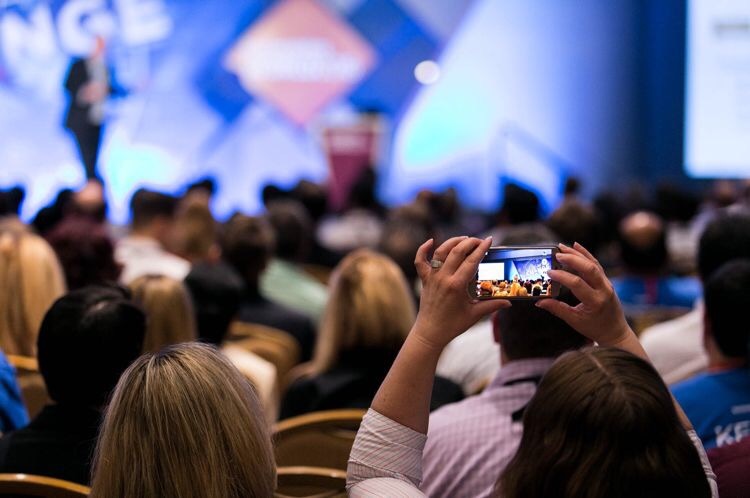 The conference has been superb and I want to thank everyone — customers, prospective customers, analysts, journalists, pundits, and partners — for being a part of this great event. I find it amazing that at such a great time to be in the cloud EPM market that we have competitors more focused on business intelligence (BI), predictive analytics, and functional performance management than on core EPM itself. At Host Analytics, we know who we want to be: the best vendor in cloud EPM, serving the fat middle 80% of the market. More importantly, perhaps, we know who we don’t want to be: we don’t want to be a visual analytics vendor, a social collaboration vendor, or a sales performance management vendor — hence our partnerships with Qlik, Socialcast, and Xactly. We serve finance, we speak finance, and we’re proud of that. Oh, and yes, our customers, finance leaders, care about the whole enterprise so we offer not only solutions to automate core finance processes but also tools to model the entire enterprise and align finance and operations. You can hear about this and other topics by watching the 75 minute keynote speech and demo, embedded below. 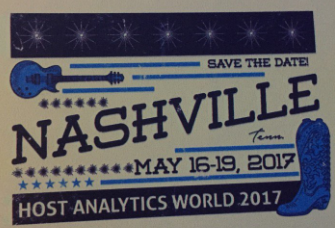 Finally, please remember to save the date for Host Analytics World 2017 — May 16 through 19, 2017.